A couple of weeks ago I ran through some of the lab and plant issues that may cause varying asphalt contents and high asphalt contents. The following is the last article in the trilogy and will explain some possible causes for consistently low asphalt contents. You'll probably notice that most of these are the exact opposite of what you'd see with consistently high asphalt contents but I encourage you to read all the way through because there are still a couple here that are unique to low results. Again, for the purposes of this post I am assuming that you are using an ignition oven to test for asphalt contents. Is the correction factor current? Has the rock source changed in such a way that the correction factor should be adjusted? Did the correction factor contain the correct amount of additives? Many people don't realize that 0.5% Liquid Antistrip means 0.5% of the weight of the binder, NOT the weight of the aggregate. This could give you a 0.45% higher correction factor than you should have and your test results will look consistently low by the same amount. Is there still a residual film of black asphalt on the aggregates following your burn? Your oven may not be burning off all of the oil that it should be. This could be due to a variety of reasons but most involve dirty and/or clogged air tubes. Perform a lift test to verify this and if it fails refer to your user manual for what needs to be cleaned and how. One way to double check your AC content results in the laboratory is to run additional tests in the lab. The Rice test, bulk specific gravity of compacted HMA, AC content by Nuclear Oven, AC content by extraction, stabilometer, and calculating the sample's volumetrics can all verify your varying oil contents on their own or when compared to the charts in the mix design. If you can't find an issue in your lab move on to the plant. Does the aggregate moisture in your computer match the actual aggregate moisture? If the plant is set higher than the actual moisture the computer will think that you are putting in less rock than you actual are and add less asphalt than you need per your mix formula. One way to check this is testing the feed aggregates for their moistures and comparing the combined moisture content to what is entered in the computer. You can also typically mitigate this in the laboratory by running a CT 370 test on every oil content you run. However, I caution you with depending too much on CT 370 when running rubber mixes as CT 370 may not be effective with crumb rubber in the mix. Are your aggregate belt scales weighing correctly? If your scale(s) are reading low then you will have lower asphalt contents because the computer thinks that you are putting in less rock so it puts in less oil per your mix formula. Is your belt scale binding? You can see the same problems as in #3. Is your asphalt meter calibrated correctly? If it is reading low you will have the same issues as in #3. Are you sampling early in the production range (0-50 tons)? Drum plants take some time to get the materials mixed well and if you are sampling too early you may be getting material that has not gotten enough oil yet. Some plants even waste their first 50 tons out of the drum for this reason. Is your weigh pot emptying completely with each batch? If it is not, you may have some rich batches and some dry batches. You should check your scales to make sure that they are weighing correctly. Batch plants are typically very accurate in how much oil you are putting into the mix. This is because there is not as much risk as in a drum plant in how it is mixed because each batch is mixed on a much smaller scale. One benefit to a batch plant is that most automated systems can give you a readout of the exact weight of each bin of material and asphalt that was added to the batch. These reports can be extremely useful in seeing trends in your asphalt weights. Is your weight pot calibrated correctly? If it is reading high you will have a lower oil content. Is the aggregate fully coated with asphalt? If not, it may be due to the oil injectors not operating properly. There could be an electrical issue or leak. 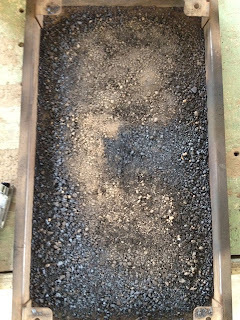 Your technician may be consistently sampling from the dry side of batches, showing a consistently low asphalt content. Is the mix gradation cohesive or are some parts fine and some parts rocky? Take a look at a truck of hot mix and be sure to dig into the bed a little bit. If the pugmill is not mixing fully, the top half of the batch (the part you can see) could still look cohesive even though the bottom half may not look like the top. 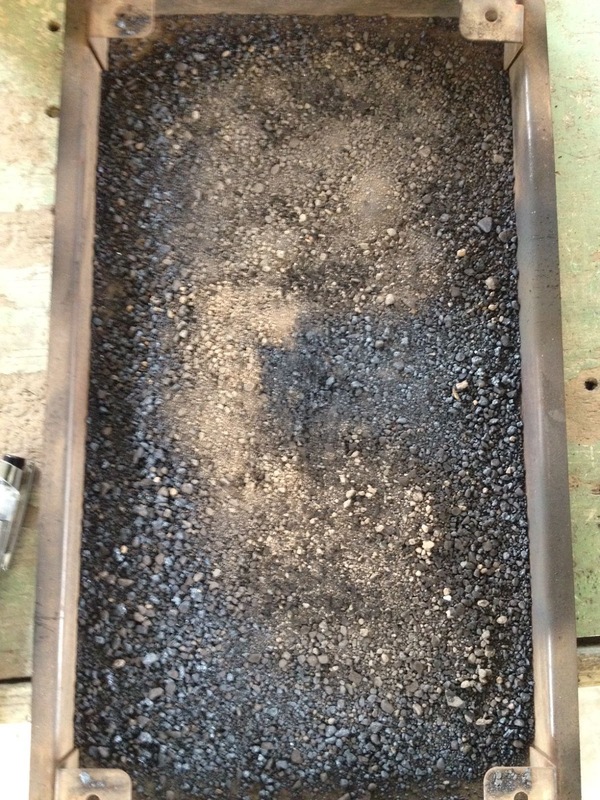 Coarse samples have less asphalt than fine samples because the fines will absorb and hold onto more asphalt. Improper mixing could be due to missing pugmill tips, poor paddle alignment, or you may just need to increase your mixing time. Is there and automation error? Many batch plant automation systems have complicated equations that are used to determine how much aggregate and/or asphalt is added to a batch. One of these equations is "free-fall compensation" which calculates gravity into the weight of the aggregates and/or asphalt in an effort to reduce the amount of time it takes to make a batch. Instead of waiting until the scale meets its actual target value it will calculate the free fall compensation and drop the material into the pugmill a little bit early. It is rare but possible that your computer is not calculating this correctly and if you run out of options you can always call the manufacturer and find out if it may be the cause of your high asphalt contents. Do you have a mineral filler injection system? Check to ensure that it is operating properly. If it is injecting too much mineral filler into your mix you could see a lower oil content and a dryer mix. Are there any holes in your bins that could be leaking aggregates into your pugmill when it shouldn't be? The additional aggregates may not show up in your weights of aggregate and you will end up with more aggregate than you need, and as a result a low asphalt content. There are sure to be several other reasons that you may be showing a consistently low asphalt content at your plant. The key is to have an open mind and make sure that you keep the finger pointing to a minimum so that your employees feel comfortable letting you know what is wrong when they see it. Changed the definition of Specific Gravity from a ratio of mass to a ratio of weight. For each specific gravity term mentioned, it now notes what California Test Method(s) you will see it in. The June 2012 version can be found on the Caltrans website and here. Happy Reading!